Affordable Wordpress websites with online booking and payment systems. Sydney Wordpress developer. Extend your Wordpress website today. Licence 2 Drive is a Northern Beaches driving school. While their target market is primarily teenagers learning to drive, I undertook a keyword and search engine marketing campaign to target niche markets by research showed were overlooked by other driving schools. A fast website that was very easy to use on a mobile phones, tablets, etc, as these are the devices of choice for the client’s primary age demographic. Online booking system so students could quickly and efficiently book and pay for driving lessons online, saving the client time and not spending time answering phone calls while undertaking lessons. Optimise the website for broad reach keywords plus niche markets overlooked by other driving schools. Create a solid website foundation with the option to easily and cost effectively expand the business into other locations in the future. Rebecca has been thoroughly helpful and informative throughout the entire process, willing to make the smallest changes to achieve the desired outcome. Such a smooth process. Really good job, well done and thanks. – Ian Milner, Licence 2 Drive. 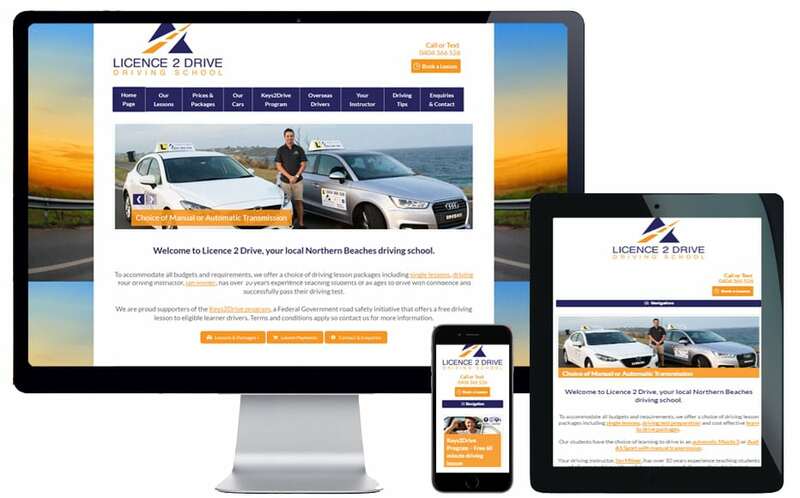 Licence 2 Drive is a Northern Beaches driving school offering a choice of driving lesson packages including single lessons, driving test preparation and cost effective learn to drive packages. Students have the choice of learning to drive in an automatic Mazda 3 or Audi A1 Sport with manual transmission. Driving instructor Ian Milner, has over 10 years experience teaching students of all ages to drive with confidence and successfully pass their driving test. They are proud supports of the Keys2Drive program, a Federal Government road safety initiative that offers a free driving lesson to eligible learner drivers.